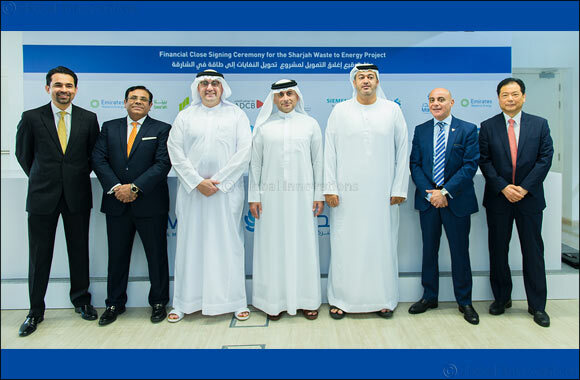 Abu Dhabi, UAE, October 23, 2018: Masdar (Abu Dhabi Future Energy Company) and leading environmental management company Bee'ah have completed the financing of a US$220 million waste-to-energy (WTE) plant in Sharjah, the UAE's first. A signing ceremony took place at Masdar City recently with HE Khaled Al Huraimel, Group Chief Executive Officer of Bee'ah; Mohamed Jameel Al Ramahi, Chief Executive Officer of Masdar; HE Khalifa Al Qubaisi, Deputy Director General of ADFD; Mazen Zo'mot, Head, Wholesale Banking (Abu Dhabi & Al Ain) of ADCB; Imran Saeed, Senior Executive Vice President, Siemens Financial Services; Masatoshi Takesako, Regional Head, Middle East, SMBC; and Abbas Husain, Managing Director, Head of Project Export & Finance MENAP at SCB. The Sharjah Waste-to-Energy Facility is being managed by Emirates Waste to Energy Company, a joint venture formed by Masdar and Bee'ah last year, and is expected to be on stream by 2020. Located at Bee'ah's Waste Management Center in Sharjah, the new plant will process more than 37.5 tonnes of municipal solid waste (MSW) per hour to generate electricity sustainably. Once operational, it will contribute significantly to reaching the UAE's target of diverting 75 per cent of its solid waste from landfills by 2021, as well as Sharjah's zero-waste-to-landfill goal. HE Khaled Al Huraimel, Group CEO of Bee'ah, said: “Through this project, Bee'ah and Masdar have exerted their collective energies towards diversifying the renewable energy sector, and identified a sustainable energy source with a long-term competitive advantage. At this stage, the support of these renowned financial institutions demonstrates international recognition of the project, and its feasibility in the context of the framework for sustainable economic growth. The plant has been designed to meet the strictest environmental standards, including the European Union's Best Available Techniques, widely recognised as the global standard on industrial environmental performance. French engineering company Constructions Industrielles de la M�diterran�e (CNIM) was appointed last May to design, build and operate the facility on completion. Masdar's renewable energy projects are located in the UAE, Jordan, Mauritania, Egypt, Morocco, the UK, Montenegro, Serbia and Spain. The Sharjah Waste-to-Energy Facility is one of a number of innovative and commercial renewable energy projects that Masdar will be showcasing throughout the Water, Energy, Technology and Environment exhibition (WETEX), organized by Dubai Electricity and Water Authority (DEWA) in Dubai from October 23-25. Masdar thought leaders will also be participating in the concurrent Dubai Solar Show and WETEX Technical Sessions, speaking on a diversity of topics including Saudi Arabia's renewable energy ambitions (Oct 23); the growth of the clean energy sector in Jordan (Oct 23); intelligent mobility (Oct 25); and smart cities (Oct 25). Bee'ah will also be sharing insights into MENA's evolving waste to energy sector, and on the development of the Sharjah Waste to Energy Facility (Oct 24).